Big Local is a lottery-funded 10-year project dedicated to making communities better places to live. 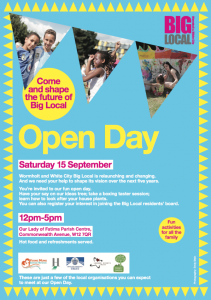 There are 150 such projects across the UK, and last weekend, on Saturday 15 September, Fiona was invited to run a workshop at Big Local in White City, taking feedback from the mums of the community about how they saw their lives and what they thought needed improving in their area. White City is an area with a considerable rich-poor divide; stepping from the estate where Big Local was holding its ‘Shaping the Future’ open day to the wealthy streets surrounding it is a positive culture shock. Most of the families at the open day are struggling financially, but community spirit is strong: Fiona very much enjoyed being directed to the meeting point by two young locals whose helpful and upbeat attitude spoke of some excellent parenting in their background! Of course, different individuals have different needs, but there were some common themes that point up issues everyone concerned with social wellbeing should be aware of. The mothers reported that crime in the area made them worry for their children’s safety, but that police were slow to respond to calls, and sometimes didn’t show up at all. They were also eager for their children to experience healthy challenges and stimulation, such as good education, activities and time outdoors, but felt that there wasn’t enough support or places to go. For their own part, access to services was a key concern, as was an interest in learning how to cook nutritious meals. In general, the mums of White City showed themselves an impressive lot, very keen to do right by their kids and their community. Many struggling mums, we’re sure, can relate to their concerns: it’s hard to keep kids off their phones when there’s nowhere to take them, hard to feel like a good mum if you never learned how to cook healthy food, and hard not to feel frustrated when the infrastructure just isn’t there for you. (This is one of the reasons we’re so invested in Make the House a Home, our crowdfunder which regular readers will be familiar with: a safe and positive space to visit can be a real lifeline.) We were happy to have the opportunity to gain firsthand accounts, which we’ve gathered into a report and passed on to Big Local; we wish them all the best of luck in using the information to put their funds to best account, and hope to work with them again soon! © 2019 Young Mums Support Network.